Vinicius, 18, moved to Real in June a year after signing from Brazilian giants Flamengo for 42 million euros ($48.7 million) but has been unable to get into the first team and has been playing for their reserve side Real Madrid Castilla in Spain's regionalised third division. 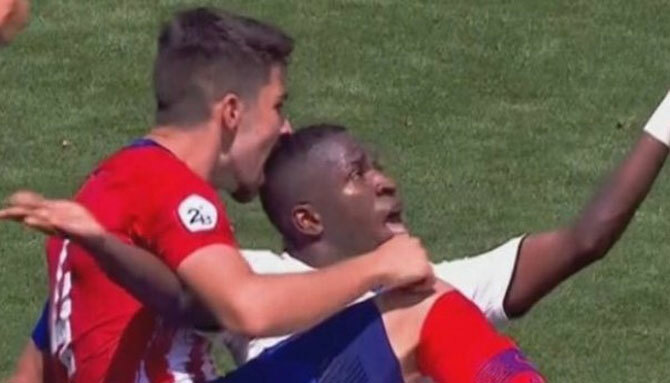 He netted both Real's goals in the derby which finished 2-2 but clashed with Atletico Madrid B's captain Tachi, who tried to sink his teeth into the back of the Brazilian's head as the pair tussled for the ball. Barcelona forward Luis Suarez is infamous for biting opponents on three occasions while playing for Ajax, Liverpool and Uruguay although he has not done it again since joining the Catalan club in 2014. Veteran Real Betis midfielder Joaquin Sanchez came off the bench to score the only goal to give his side a 1-0 win over city rivals Sevilla on Sunday and end a 12-year wait for a home victory in the local derby.